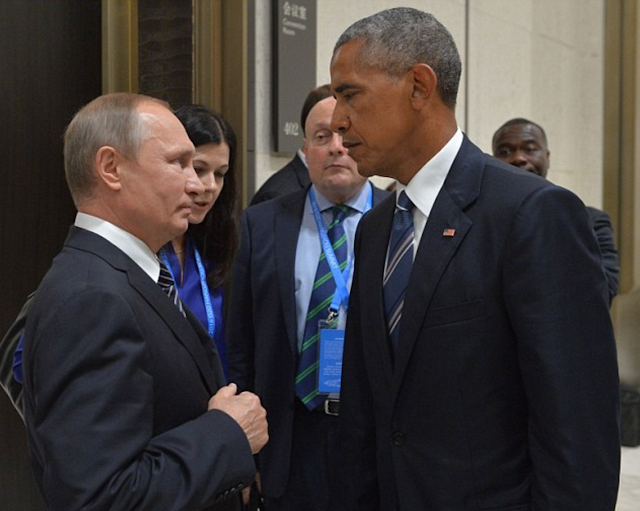 Much has been made of this "stare down" between Vladimir Putin and Barack Obama during the recent G20 Meeting in Hangzhou, China. However, without the dynamics of real-time experience or a video to put it this moment in context, it most probably is simply eye contact during conversation (but between the two most power people in the World). Yet further evaluation yields some other notable details. Notice how Mr. Putin is "Body Pointing" toward Mr. Obama, yet Obama is rotated outward. While it is absolutely important to point one's feet, hips, torso, shoulders, head and eyes directly at the person with whom you're shaking hands, after 5 - 7 seconds there should be a slight (20 - 30 degrees) rotation of the lower limbs, hips and to a slightly lesser degree the torso. This is particularly important with men as this rotation maneuver helps to diminish feelings of confrontation. Note also that Putin keeps his head and neck straight - and does not tilt them back - rather he just rotates his eyes in an upward gaze toward Obama's eyes. By adopting this configuration Putin does not subordinate himself to the taller American (Obama is 6'1" [1.85 M] while Putin is 5'7" [1.70 M]). It also can make him look a bit intimidating to taller individuals - because from their perspective, it gives the appearance that he's looking at them through "Lowered Brows". Another important detail here is Putin arm position. He's keeping his hand and arm up, positioned at his central lower-chest level - acting as a barrier between him and Obama. This is good example of beta body language. Putin is very alpha (often Hyper-Alpha) when he's on Russian soil - yet when he's visiting another country, he slips into lower levels emotional comfort. Putin's tentativeness is showing. His arm and hand are acting as a barrier. He's being protective.